I have recently begun to learn somethings about beer and I suddenly noticed that, for a while now, I have always been served similar types of beer on different looking beer glasses... which is confusing me. It could be human error, but it's got me wondering what beer glasses should I really be sipping from? So I decided to get some beer glasses, and what do I find? A plethora of beer glasses, all kinds and funky shapes, where not one glass is like the next. It makes me feel like the beer glass industry is very opinionated, rather than factual, and I need to know how to choose correctly. Could anyone please instruct me on the general type of beers and how they pair with beer glasses, as well as why x glass goes with y beer? It might sound snobbish to be peckish about the type of glass but the glass does influence the taste of the beer. Some things are: - the thickness of the glass. A thin glass invites to a more delicate way of drinking, a really thick glass would let you expect a sturdier beer. - the surface compared to the volume of beer. A big surface gives a change to let of more aroma's but I would think you also need a little more foam. - the capacity to keep the aroma's. As pointed out by Rube. Think of a cognac glass versus a vase. Some glasses also take in you nose deeper than others. - the way the beer flows. The shape of the glass how quickly you can drink it without spilling. Think of kwak, you HAVE to drink the last very carefully. So to answer your question: there are many factors how the glass influences how you taste a beer. What's best is very subjective. You could at first stick to the opinion of the brewer, what he finds the best glass for it. If you like the taste with an other glass better, use that. I would not approach this as a hard science. Brewers might choose a specific glass to "stand out". 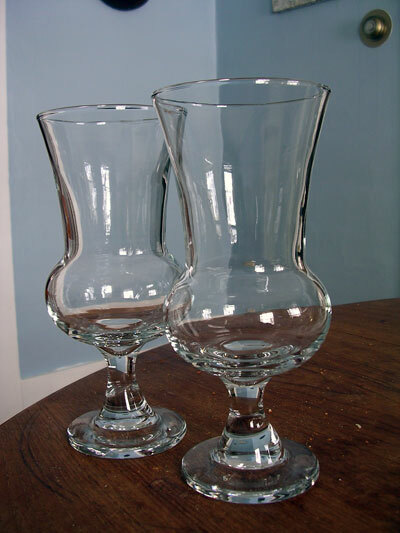 Beer glasses are mainly a product of the region in which the beer was originated and therefore tied to a specific beer. Belgian beers - Normally served in goblets because the beers have very complex aromas and the shape of the glass can help present and concentrate them for consumption. British beers - Normally served in the "nonic" glass. Simply a glass that is easier to hold in the hand whilst standing around the pub. Normally associated with most British ales. Pilsner - High sided flute to concentrate the hop aroma and show off the high carbonation of Pilsners. Weissbeir - German wheat beers are usually served in tall glasses to show off the cloudy beer and also the creamy tall head of foam. Scottish Ale - a Thistle glass designed to evoke the image of the national flower of Scotland. Stout - Popularized by Guinness, a glass designed to show off the nitrogen bubbles. Not the answer you're looking for? Browse other questions tagged taste style serving glassware pairing or ask your own question.